A practical guide to the best breaks and beach bars in Vietnam. WITH MORE THAN 3000 kilometers of coastline, the potential for finding waves in Vietnam is limited only by time and motivation. Oh, and a pretty serious language barrier. And some very inaccessible coastline. And unexploded bombs. 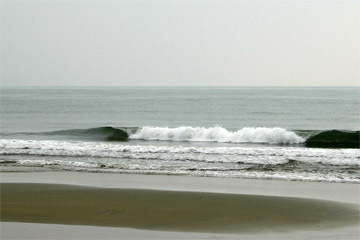 Surfing in Vietnam is possible from Vung Tau in the south right up to Dong Ha and beyond on the central coast. There are some established surf spots around China Beach and Mui Ne, but the rest of the coastline its still mostly unexplored. The best time for surf is between November and March, when the winter monsoons blow in from the north. This is also the best time for typhoons to develop, with several forming in the South China Sea each year and lashing fishing villages and coastal towns. For surfers, it’s these typhoons that produce the biggest swells. Typically it’s short period wind swell, rather than groomed ground swells. They also tend to disappear almost as soon as they arrive, usually within a couple of days. For much of the year the water is bathtub warm, with the temperature hovering between 25 C (dry season) and 30 C (wet season). Board-shorts are about all you need, along with a shorty or rashguard for windy days. As you’d expect for a country that saw some of the most ferocious fighting of the 20th century, dangers are still present today. Unexploded ordinance (UXO) litter the countryside, so straying off the beaten path is not advisable, particularly around the Demilitarized Zone north of Dong Ha. This presents a challenge for anyone searching for new waves in Vietnam, as there are actually very few beaten paths to some beaches. In comparison to unexploded ordinance, hazards in the water tend to be less life threatening (at least not immediately). The trash that is a feature of many cities and towns in Vietnam tends to find its way into the ocean, along with nasty storm water runoff and industrial pollution. After several conversations with expat surfers and locals alike, I didn’t hear of a single shark sighting, let alone a shark attack. The epicenter of surfing in Vietnam is China Beach. 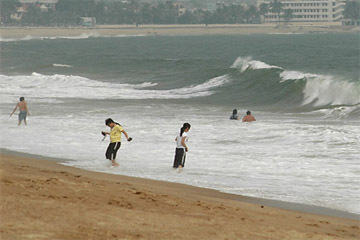 The epicenter of surfing in Vietnam is China Beach, a long, sandy beach that stretches 30 kilometres south from Da Nang. American GI’s stationed at the base here regularly surfed China Beach in the 1960s. These days you’ll find expat engineers and English teachers in the line-up, along with a small but growing number of Vietnamese locals. China Beach can get good too. Very good. Typhoon Durian, responsible for thousands of deaths in the Philippines and Vietnam in 2006, was also responsible for producing clean, four to five foot peaks the length of the beach. The options for surfboard hire are also good. Tam’s Pub and Surf Shop south of the Marble Mountains has a variety of boards for hire from $5 usd. Gunnar, a German expat, rents fiberglass boards out of his home near the old U.S. air base. In between these two options is Hoa’s Place, a must-visit destination. Hoa and his lovely wife run a relaxed, ramshackle restaurant and guest house in front of a choice left and right sand bank. Curiously, they are also right next door to a police training facility. The early morning reveille calls serve as a handy dawn patrol wake up for surfers. Hoa rents three beaten up boards to guests and visitors. After the morning session, the open air restaurant becomes home base for post-surf analysis and Hoa’s freshly made spring rolls. For first timers he’ll even demonstrate how to roll them properly. A three hour bus ride from Ho Chi Minh City will get you to Mui Ne. The southern part of this quiet beach resort follows a single, palm tree lined road that runs parallel to the coast. Quaint bungalow accommodation and thatch-roofed bars are located along this strip, including Jibes Beach Resort, a chilled-out bar that offers a great view of the sunset and ice cold beers. Jibes is the focal point for traveling kite and wind surfers in Vietnam. You can also rent epoxy surfboards here from US$5 per hour. This south facing beach needs a pretty large swell to start working, but there is evidence it does get good – on the walls of the club are photos of surfers riding small but clean waves. Further north past the fishing village is an east-facing beach that picks up more swell and is offshore in westerly winds. The only problem here is how to get your hire board from Jibes to this beach. A twenty minute scooter ride means you’ll either need to be adept at riding one handed or have a passenger who is able to hang onto the board for you. The high rises, beach bars and bright lights of Nha Trang are certainly not to everyone’s taste. I know I was glad to leave after just one week. But that was partly because my body was sore from the poundings the ocean delivered each morning. Along the main beach a ferocious shore dump made for some exciting body surfing. I didn’t see it drop below four feet the entire time I was there. North of Nha Trang’s main strip is the Cai Rai river mouth, which in the right swell and tides could have surfable waves peeling off the outside sand bars for the brave or adventurous. Beyond the river is Hon Do Island and Hon Chong peninsula, both of which feature shallow rock ledges with fast right-handers spinning down the reef, offshore in west north-west winds. The problem wasn’t a lack of swell, it was a lack of surfboard hire. It was only on my last day in Nha Trang that I found a surfboard for rent. A beat up epoxy model, it had no fins and no wax. Go figure. Getting from A to B in Vietnam is often an exciting challenge in its own right. Scooters (also known as motos or mopeds) are the cheapest and fastest way of exploring the coastline around towns. They usually cost from US$5 per day (cheaper for weekly hire). For traveling between towns, Vietnam has an excellent bus and train service. However, they’re not geared for handling fragile surfboards. If you do bring your own board, it may be best to hire a van and a driver. This won’t be cheap (in excess of US$30 per day) but it’s really the best option for getting off the beaten track. Matador’s Vietnam expert Delacouri knows more about the rare monkeys of northern Vietnam than just about anyone. As for surfing, Angie Takanami is an expert on the best breaks in Asia and Australia. For a great surf story, you can’t do better than Matador editor David Miller’s classic “Notes On Los Pitayeros“.